Nobody can dispute that the awareness of Chinese Export Silver has grown exponentially in the past five years; there’s also far more of it appearing in auction house sales – but is the understanding of it there? Chinese Export Silver is, by default, an extremely complex silver category and it is only recently that it has become sufficiently unravelled for a true understanding of it to begin to develop. 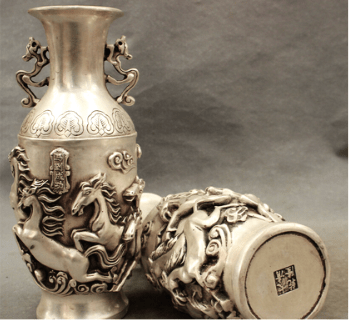 Until recently the general rule of thumb was that the majority of Chinese silver appearing in auction houses was of good quality, some of it exceptional, while the lesser items were more likely to be found on e-commerce platforms. In the past year this ballgame has changed dramatically and one of the most challenging reasons is the appearance of fake or pseudo items. Until a year ago Chinese silver was virtually a fake-free zone in the West. After a gradual appearance of the odd item here and there, today there is a virtual flood of items that mainly set out to beguile the audience with historical facts, attributes and marks that attest to them being special, most of the claims being spurious – and that’s being kind! There have even been instances where counterfeit items that have been acquired online have re-appeared in mainstream auction house sales, some in houses that quite frankly should have known better – I shall remain kind and refrain from naming and shaming them. Unlike auction houses that have experts, most online platforms have none. It is possible to offer ‘antique’ Chinese silver items for sale supported by descriptions that many will find perfectly plausible, when in reality they are anything but. The absence of administrative control on content or the inability or unwillingness to do so simply because it would be almost impossible to implement effectively has created a new minefield for prospective Chinese silver buyers or even seasoned collectors to tackle. It has also provided sellers with an wide-open window of opportunism. The new reality of factories in China churning out Chinese silver “antiques ready-to-go” as we speak is alarming. These are not small workshops – they are large-scale production factories that in many cases produce high quality items – they just happen to be hot off the press rather than the “late 19th century” which often, as if by magic, is claimed to be their birthright. While silver has not attained the vast levels of production that the present-day factories in Jingdezhen achieve with “antique” Chinese porcelain goods, silver production is now an industry that has the ability to threaten the integrity of what once was a gentlemanly pursuit. The said factories are tantamount to being 21st century antique terrorists! 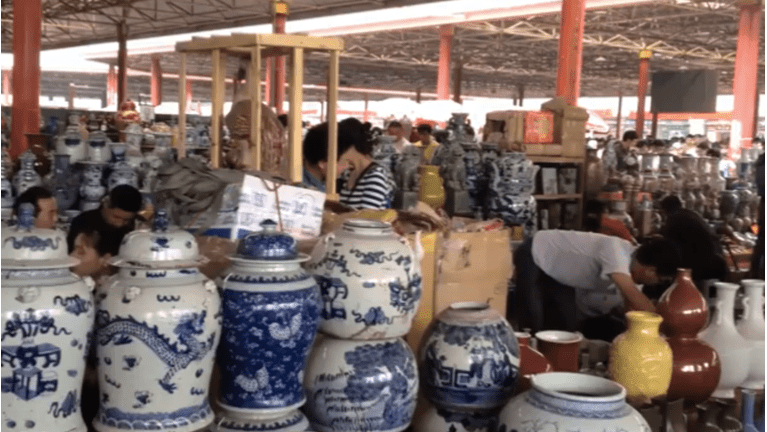 I am reminded of the time my good friend Lars Tharp regaled me with a tale of a visit by him a few years ago to Jingdezhen where he encountered an establishment called “The Antique Chinese Porcelain Factory”. At the time I thought it highly amusing, and still do, perhaps buoyed by being confident that the Lars Tharps of this world were more than capable of spotting the ugly duckling in a Chinese porcelain beauty parade; the same cannot be said for the world of Chinese silver. Beijing Antique City, Chaoyang District, Beijing – over 4000 “antique shops”. Anyone who has visited China recently is probably aware of the vast amount of jade and pearls that are claimed to be authentic. One of newest kids on the block on the fake block is amber. So masterful are the fake amber pieces, even expert eyes are challenged. When confronted with colossal multi-storey shopping malls devoted almost entirely to the art of high quality fakery, it is enough to reduce even the most seasoned expert’s confidence to an all-time low. 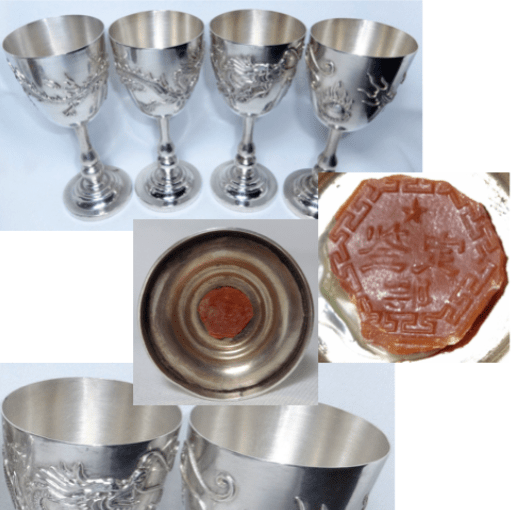 The set of 4 silver goblets are listed as being “Chinese export silver 4 cups DRAGON & SACRED PEARLS OF WISDOM Wax Seals Antique” – they also state that “each of the 4 pieces has a wax export duty seal”. The rather spurious wax seal states “Jian Ding 20 鉴定二〇。” alluding to an “Identification 20” – no such mark, no such seal and no such wording would have been used on authentic Chinese silver of the 19th or even pre-Revolution 20th century. 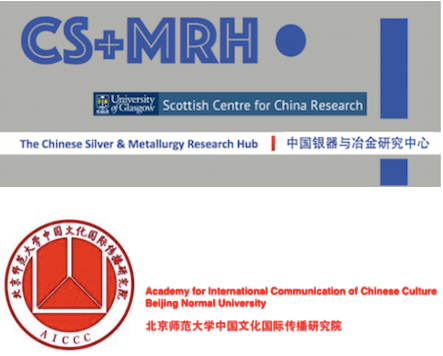 Probably the only true part of the the two statements is “Chinese export silver”, or at least I think that is so. 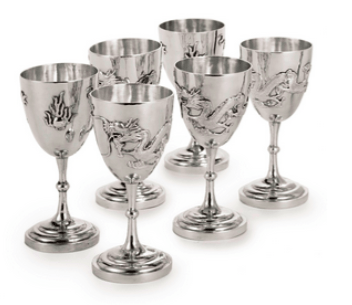 They have been exported, albeit recently, but as for the silver, it is untested – none of the goblets carry a silver mark but the brains behind these items has opted to add wax seals in order to evoke “authenticity. The seal actually masks the fact these goblets have not been made in the traditional 19th century manner with the stem and base being secured by a quatrefoil-shaped nut screwed to a central screw shaft. The seals sadly cannot mask the obvious machine marks of the goblet interiors. The goblets are nothing but a bad a pastiche of the type of goblet [right] sold at Christie’s, Paris with full silver marks on each item. 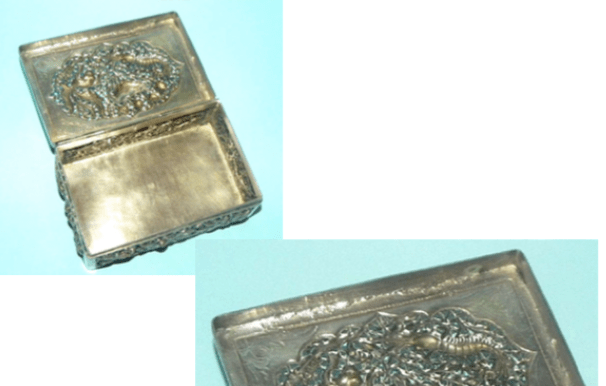 The “antique terrorists” responsible for these fakes may be clever – they make even be skilful, but one thing that is virtually impossible to replicate is the grey colour quality and the soft, slightly soapy feel that antique Chinese silver has. Comparing the pastiche goblets with the Christie’s examples, the former have a bright, almost chromium colouring and the applied dragons of the set of 6 are far crisper, more defined and accomplished. Despite the dramatic rise of awareness of Chinese silver, the disparity of understanding of it between China and the West widens. Where Chinese collectors have little focus or interest in the retail marks, Western collectors and even most Asian art experts still insist on referring to the retailers as “the makers”, with many a description of an object waxing lyrical about their renowned workshops – none of these names had workshops; the majority of the names were fictitious. On the other side of the coin, the very small group of true Chinese connoisseurs that exist understand the individual merits and idiosyncrasies of the master artisan silversmiths whose names can only be known by reading the Chinese character “chopmarks”. This is how it should be and just as it is perfectly natural we can know and understand the painters of the Royal Worcester factory, familiarity of the Chinese artisan silversmiths in conjunction with the house styles demanded by each retail silversmith is the only way this highly complex silver category can be understood. Only armed with this familiarity can one hope to battle the new wave of “antique terrorists”. The “bargain basement” end of the fake silver market is probably the most prolific, with silver vases parading in their hundreds, often in pairs and many bearing marks that never existed outside of this fantasy world. Fantasy is probably being kind – they all have more affinity to the Hammer House of Horrors than to authentic antique Chinese silver. 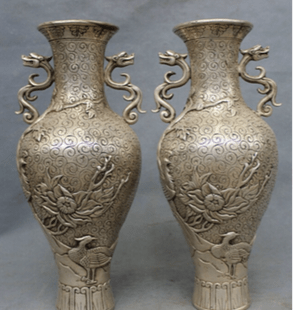 These vases are often referred to as “marked palace vases”, they are described as being several kilos in weight and they are invariably decorated in an exaggerated version of traditional Chinese motifs that appear almost cartoon-like against the real thing. 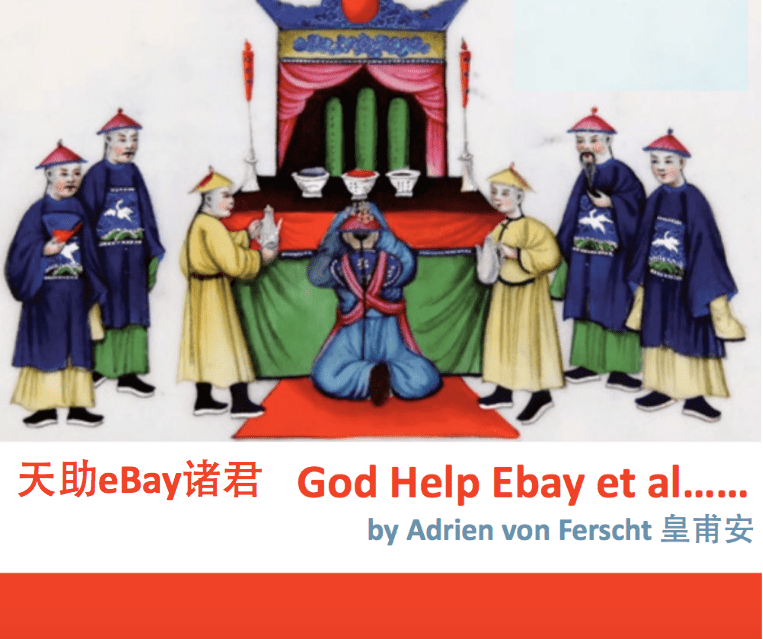 The Chinese online selling platform Alibaba is awash with this ghastly silver but they have also infiltrated Western online sites and have been known to appear in European and American auction houses. 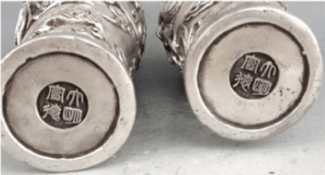 The is what appears to be an entire genus of so-called Chinese silver that masquerades under the umbrella category of “Ming Xuande” [below left]. These pieces all carry the same style of silver mark [below right] – such marks never existed in the real world. Consisting mainly of pairs of tall vases and censers, this totally false silver often commands relatively high prices and, even more frighteningly, seem to sell. It seems to be particularly prevalent on American-based sites. Chinese Export Silver items have appeared at auctions of what are regarded as the more premium auction houses posturing as “early” examples of this silver category. 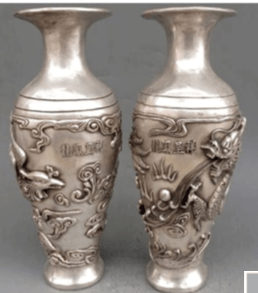 Silver vases have appeared carrying silver marks that attest to being silver along with a date or dynasty mark. Sometimes the actual mark is impressed upon a circular button-shaped lozenge that is then inserted into the base of an item [below left]. The left-hand mark below is aiming to inform us that the maker is Qi Sheng and it was made during the Qing Kangxi period [1662-1722]. The right-hand mark below states “Imperial Made Qing Dynasty”. Marks such as these were never used in Chinese silver – the plug mark on the left is so obviously not over 300 years old. E-commerce antique sites are also plagued with sellers who are either blissfully ignorant or they are blatant opportunists hoping for a ride on what they perceive as a bandwagon. 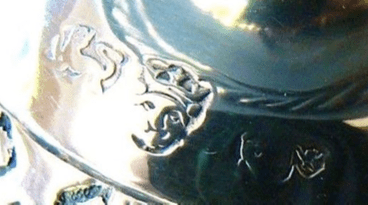 This seller-genre has it’s own rule book – if an item of silver looks Chinese or it carries a mark that looks as if it is Chinese, then it becomes a member of that ill-presumed magical club – Chinese Export Silver. Obviously well-executed and of high quality, this silver box [below] was described as “A Rare Stunning Chinese Export Silver Box With Figures 19th Century”. It is all of those things other than it is not Chinese – the box carries an 800 silver mark; no Chinese silver ever carried an 800 mark. The nearest country to China that did is Japan. The box was offered for auction on eBay, so there no checks and balances on the authenticity or integrity of this particular posting exist other than the “refund guarantees” eBay offers , but to benefit from that one would assumedly have to understand how and why this item might not be what it purports to be. It is unfortunate that these would-be Chinese Export Silver “hopefuls” so often either carry a fixed price or they achieve a price consistent with that of a high quality Chinese Export Silver item. The following intricately reticulated box carries a “Buy it Now” price tag of £3500 on eBay and is described as being “A Rare Chinese Canton Export Solid Silver Pierced Repoussé Figural Box”. Sadly it probably has not seen Canton, it doesn’t carry any maker’s identity mark other than a single 800 mark, assuming this is a mis-stamped mark. It also happens not to be “figural”. While versions of this style of box proliferated towards the very end of the 19th century and the early 20th century in Siam [Thailand]. They invariably carried silver marks of Thai Chinese silversmiths. The combination of the interior of this box and the somewhat spurious silver mark make this box highly suspect and almost certainly a modern take on the 100 year old boxes that still abound – which all makes the £3500 asking price steep, to say the least. The welding on the interior of the lid is quite shoddily executed and what is trying to be artistic repoussé and pierce work was probably stamped out mechanically leaving quite sharp edges. An opportunist – or simply a total silver novice? One has to wonder sometimes. But to jump to the assumption that because a hallmark is not clear enough to be read it has to be a “faux hallmark” and as such has to be early Chinese Export Silver is a jump to far! This “Chinese Export Silver Muffineer” is about as Chinese as I am! But to date this piece as an example early 19th century Chinese Export Silver is being just a tad too hopeful. This is simply English silver with a rubbed or badly struck date and city marks. 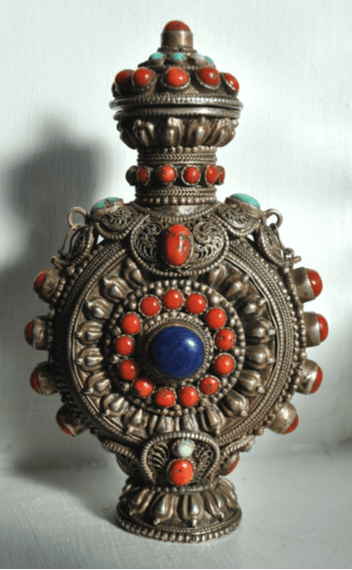 “A very rare and fine 19TH century, Qing era, Chinese Export Antique Solid Silver Filigree Snuff Bottle set with Coral, Turquoise and Lapis Lazuli stones” is how the following item is described online. It is also “exquisite and finely made with filigree details around the should of the bottle and classic shape with decorated lid shoulders and both sides set with 82 individually set semi precious stones” – all very lyrical but this is artistic license several steps too far. The bottle [left] is conveniently unmarked, brand new, not Chinese and highly likely is not set with semi precious stones. A bargain at $450! Someone obviously thinks so!! The internet is awash with “pseudo-Chinese bejewelled filigree gewgaws” [official dictionary meaning: a showy thing, especially one that is useless or worthless]. There are several factories in China churning these items out. They appear on almost every antique e-commerce site, invariably described as being 19th century along with attendant hyperboles. What is frightening is they also regularly appear in mainstream auction sales, but the most disturbing thing is they sell as if they are some intricate 19th century work of art at prices that never fail to astound. It is one thing for the collecting public to be gullible, but for “experts” to continually be duped into this 19th century fantasy is reprehensible. 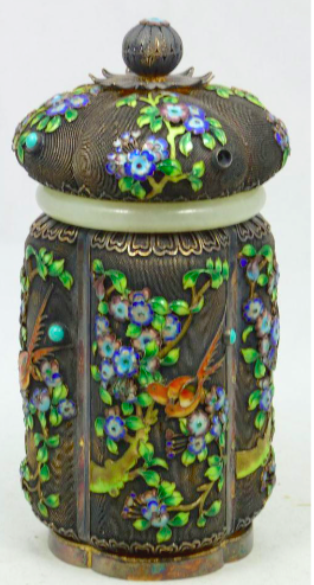 Described as “Chinese ritual canister intricately decorated in silver, mesh ground, and enamelled prunus trees, and birds of paradise in vibrant colours of blue, green and red. Mounted turquoise stones dot the panelled scene. Fashioned in four, curved panels and conforming bulbous panels on lid, this complexly crafted piece is highlighted with a gem, jadeite collar, and the lid with finial, opens revealing a gold wash interior. Hallmark on bottom: SILVER”, the internet has an infestation of such items – this particular example [right] is in an actual auction sale. Usually such canister are claimed to be “19th century” or “1800s” – there’re several known factories in China producing these items and all are marked “SILVER” [below]. No 19th or early 20th century Chinese silver was marked so; if it had the word “silver”, then it would be accompanied by a retailer’s mark and probably a silver purity mark. Does this mark really look 100 years old? I don’t think so! The activities of Antique terrorists has reached a critical stage – they are the ISIL of the antiques world. E-commerce and e-payment guarantees are fine but they are only helpful if the reality of what these items actually are can be proven. Other e-commerce platforms vary in the guarantees they claim to offer and their efficacy in terms of the buyer protection. An online war of words between a seller that is highly likely to be China-based and a disputing buyer will often lead nowhere since it is extremely difficult to legally prove that some of the descriptions are, in fact, either incorrect or false. Banning the bandits from the sites is next to useless – they appear under a different identity within minutes. Mainstream auction houses are meant to have the in-house expertise to efficiently put in place a security fence that either rejects these items or to be able to describe them precisely. To do this effectively, their radars need to be attuned to high alert and a general complacency that so often is masked by an outward self-assurance needs to be dealt with. 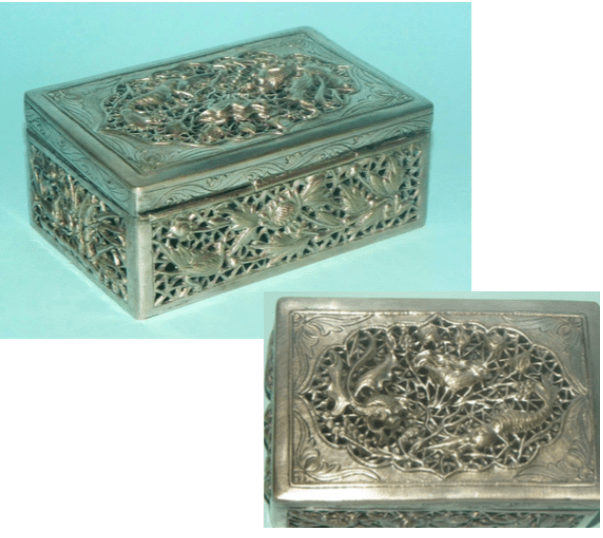 Chinese silver is a highly complex world silver category and there are a huge amount of 18th, 19th and early 20th century manufacturing period pieces still in circulation. The reality is that few auction houses truly understand Chinese silver and are particular ill-equipped to recognise and adequately identify the outstanding items just as much as there is a likelihood 21st century “antiques” might miraculously become 19th century. E-commerce platforms are a gift and a curse in equal quantities. There is a huge amount of highly collectible and, in some instances, superb Chinese silver items on offer. Without adequate understanding by all parties, this can be a minefield. Equally, the deluge of pseudo-antiques hot off the production lines in China taints a silver category that is deserving of respect and deserving of academic study. We live in a big bad world. 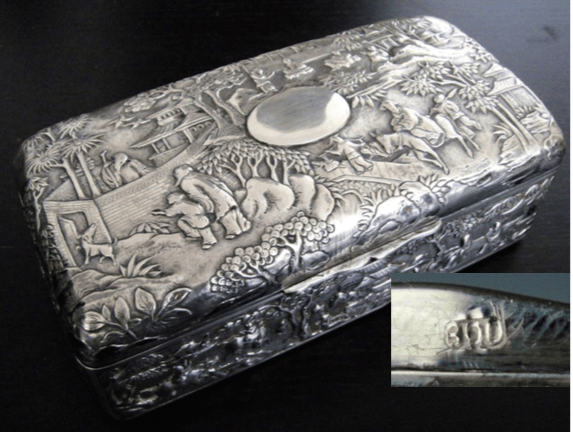 Why would antique Chinese silver be a safe haven? As with everything else, we simply have to be more circumspect, more aware and more street-smart.